Kerry Greene broke our 30-week mega-champ drought last night. Will she nab lucky number 7 this evening? If she does, she’ll be the first winner of 7 or more games to win four of those games from behind in Final. There could be some mind games here. If Kerry doubles her score, she’ll have 30,800. 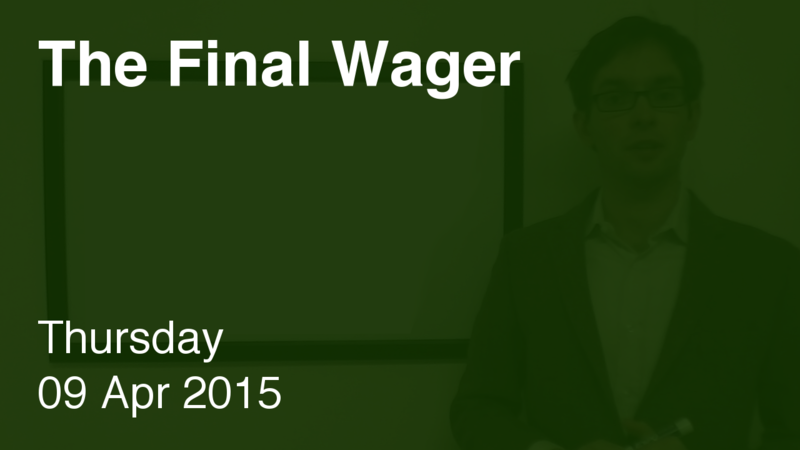 To cover this all-in wager, Chris will need to wager 12,300. An incorrect response with that wager will leave Chris with 6,200. To stay above his total, Kerry can wager up to 9,200. Lindsey can wager up to 4,000. A successful doubling will put Lindsey at 20,400. To cover this, Kerry should wager at least 5,000. If Kerry plays it safe and misses, Lindsey would need to wager at least 200. If Kerry makes the rational maximum wager of 9,200, Chris will need to wager 6,100 to cover her. If he’s wrong with that wager, he’ll be left with 12,400. To stay above him, Kerry can wager up to 3,000. Lindsey might consider risking at least 2,200. If Lindsey goes for 4,000, Kerry and Chris can respond in this manner, although that’s rather silly for Chris to do, in my view. Lindsey can cover Kerry’s 1,200 correct wager if she really wants to, but that’s low on my list of priorities. We eliminate the wagers that don’t create the tightest possible ranges. Ay, caramba! Big bets all around – but I like just one of them. Congrats to Chris on his win, and to Kerry for her fine run – we’ll see her in the TOC. What is The Elements of Style (by William Strunk Jr.)?